You don't need to make an online advance booking to avail a boat tour in Langkawi. In fact the best boat tours can be booked in the island itself and it's easy. In the following section I'll talk about how to avail and book the most popular boat tours in the island and the most credible operators. Note that most such boat tours can be availed either in sharing basis with per person rates or in private. The most popular boat tour in Langkawi is the Island Hopping Tour where the boatman takes you to three islands one after the other and let you swim, picnic and relax on the island beaches. These are usually group or shared tours that work on a per person rate, you can also charter a boat. And most of these tours leave from the Ferry Jetty at Teluk Baru near the southern end of Panta Tengah. The jetty is located about 5 minutes by taxi from Pantai Cenang. So depending on where your hotel is, you can just take a taxi and go down to the jetty. During the day time you will find plenty of boats leaving the jetty for the Island Hopping tours and all you need to do is just hop into one of them and pay the fare which is about RM35. The first such trip leaves around 9am and then in regular intervals until about 4pm. This is the easiest and the cheapest way of availing the boat tour. There are of course several other short boat trips like island drop and island beach visits etc that also take place form the same jetty. But all these boat tours operated by the local boatmen or operators are no frill trips. Which means that it won't include a guide, any food or beverages, not even drinking water. So you will need to carry your own stuff that you may need during the tours. Always wear comfortable clothes like cotton T-Shirts & Shorts, carry sunscreen lotion, towel, slippers, swimwear and drinking water. In some of the islands you visit, there will be snack stalls. Note that most boatmen are unable to speak in English. However during the high season (December through April), it may be wise to book a boat tour in advance, may be on the previous day. You still don't need to go for online booking over the internet. Because not only they will be more expensive, they may not offer any better value than what you may get locally. So a good option is to go down to Pantai Cenang Area. On both sides of the road, you will find numerous tour & travel kiosks or stalls offering all kinds of boat tours, but mainly island hopping. You can book through one of these operators. The value they bring onto the table is the hotel transfers, i.e. pickup and drop service provided you are staying nearby areas like Pantai Tengah or Cenang. The roadside travel kiosks usually have tie ups with local boatmen operating from the jetty and will actually board you into one of the boats at the jetty. Below are some well known operators who will likely do a better job than a typical roadside travel kiosk acting like commission agents. If you are looking for a comfortable boat tour in a smaller group or in private, want a knowledgeable & English speaking guide on board and coupled with refreshments and other amenities, then you will need to shell out some good amount of money and book such boat tour well in advance through a proper operator. Bill and Angelika operate their boat tours on the explorer speedboat known as Moon Dancer. They offer both private and small group tours (Mystical Island Tours 3 in 1). The group size can be from 6 to 9. They will first take you to the Lake of the Pregnant Maiden at Dayang Bunting island where you can go and swim in the magnificent lake to your heart's content or just relax and view the spectacular geopark, rainforests and the mountains surrounding the lake, or just take a leisure stroll. This is followed by a small session for fishing and finally they take you to a secluded beach in a remote island before returning. The total duration is 5 hours. The package includes hotel transfers, non spicy Asian food, local fresh fruits, beer & soft drinks, mineral water etc. You should wear comfortable cotton clothes and bring in your own towels, swimming wears, slippers, sunscreen lotion etc. Package cost: RM180 per person. Cost for child up to 12 years: RM150. The private charter trip costs RM260 per hour for 2 guests, and RM80 for additional guests for food & beverage. The package includes transfers, Italian style food, 1 bottle of wine, beer, soft drinks, mineral water etc. Phone: +6017 242 7013; +604-955 5526. They organize the usual island hopping tours daily covering the three islands (Pulau Dayang Bunting, Pulau Singa Besar, Pulau Beras Basah). The tour usually starts at 9am and lasts for about 4 hours. They have pick up and drop services for nearby hotels in Pantai Tengah and Pantai Cenang. On a sharing basis their rate is RM35 per person including pickup from certain locations. They also offer private (i.e. chartered) Island Hopping Tour (RM300 for up to 8 persons, RM350 for up to a group of 10, and RM450 for up to 14 persons on a boat). They are located in Kuah at Jetty point just behind Kenny Rogers. They offer Island Hopping boat tours. Other offerings include tour of Pulau Payar Marine Park, car/van/bike/boat rental etc. (Note Auntie speaks Cantonese). Another novel and adventurous way of experiencing island hopping is by Jet skiing which is offered by few operators. You can ride single or double. The rates are of course going to be far higher and so will be the excitement. Check out Jet Ski Tours in Langkawi for details. Kilim Geopark & Mangroves is another extremely popular boat tour in Langkawi. While there are several operators in the island offering this tour, only few are able to offer the very best. You can go down to the Kilim Jetty at the north eastern end of the island or the jetty close to Tanjung Rhu Beach and hop into a boat by paying a per person rate. These boats take up to 10 persons depending on its size and the trip lasts for about 4 hours. These are again no frill trips and the cheapest. If you take the whole boat, it costs about RM300 for 4 hours. You can also take it for 2 hours. There is no guide on board. One of the best Geopark & Mangroves trips is organized by Malibest Resort (Tour Desk) located at Pantai Cenang. They specialize in this tour and offer it to outside guests as well. The offerings include air-conditioned van transfers, English speaking guide etc. Packahe cost is RM120 per person. The tour starts at 9:15am and returns at 3:30pm. Hotel guests get discounts. Another great way to avail this boat tour is to take a nature friendly kayak tour through the geopark & mangroves. Dev's Adventure Tours or JungleWalla organize such tours that last for about 4-5 hours. Visit Top Nature Tour Operators to get details of the offerings. If you are looking for a sailing cruise like a sunset cruise or a day or romantic cruise on a yacht, then visit Langkawi Top Sailing Cruise Operators to know about who are the best in business, their offerings and contact info for booking & inquiry. 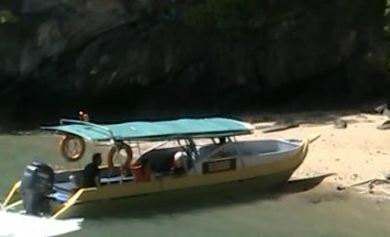 1) Langkawi Boat Tours: The great boating tours in Langkawi.